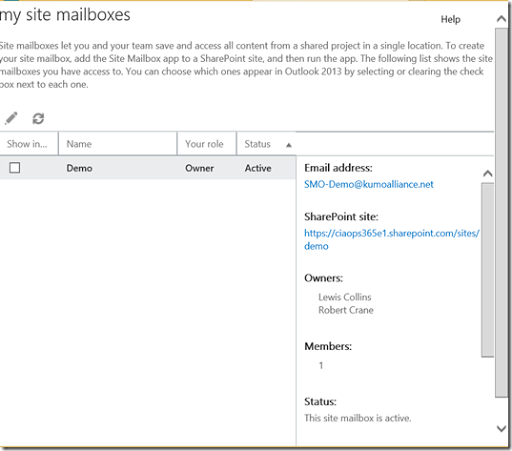 SharePoint Site Mailboxes allow you to have a shared mailbox for each user of a Team Site in Office 365. But you know what? When I try that I don’t see the Site Mailboxes as an option on the left hand side any more! Bummer. So how can you administer these mailboxes if you need to if you can’t do it from Outlook Web Access? 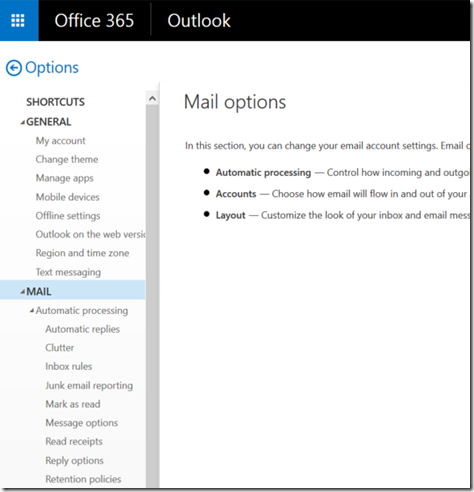 Your first option is to open Outlook on the desktop and then right mouse click your mailbox name at the top of the tree (usually your name or email address). As you can see from the above screen shot that will display a menu and from there you can select the option – Manage All Site Mailboxes. That will open a browser, prompt you to login to Office 365 and then take you to the my site mailboxes page as shown above. You will see any Site Mailbox you have access to, be able to select and edit its properties. This will take you to exactly the same page as above. 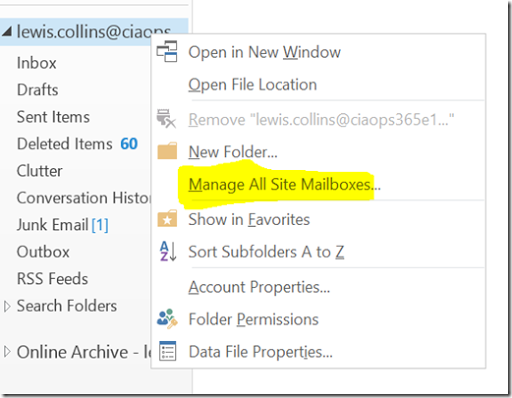 Thus, if you can’t find the Site Mailboxes option in your Outlook Web Access to administer SharePoint Online Team Site Mailboxes you can use either of the above two methods to get to same destination. Previous Post I spoke too soon!